When you find a friend who accepts you for who you truly are, has your back no matter what, and is right there on the couch next to you when you need a night of binge-watching Netflix and chugging wine, the best thing you can do is keep them as close as possible. Does someone come to mind? 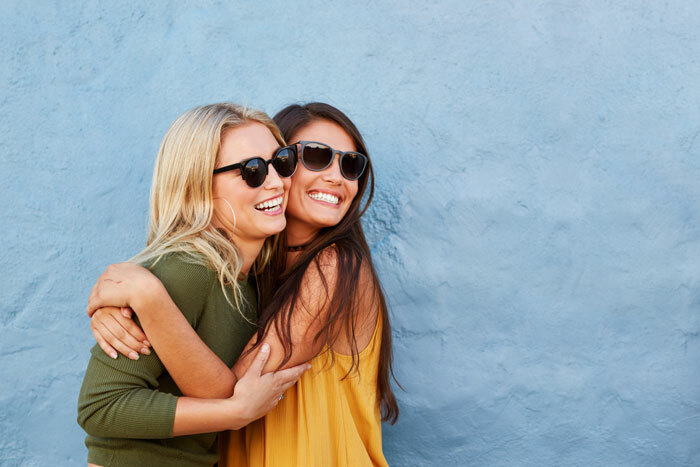 Ahead are 12 things only BFFs will understand. Ice cream heals all wounds, and a best friend knows exactly which flavor to bring you even on your lowest of days. The Cristina Yang to your Meredith Grey, a best friend knows your experiences, secrets, and everything in between better than anyone else. BFF telepathy is a real thing! Best friends just have a way of knowing exactly what the other is thinking without even saying a word. Your best friend knows your flaws and loves you unconditionally. This one is a given. When somebody says, “don’t tell anyone,” that obviously excludes your best friend, right? What’s Bachelor Monday without witty commentary and a glass (or two) of wine with your BFF? It may not always feel good, but a push from your best friend is exactly what you need sometimes — and they always have your best interest at heart. Whether you just got dumped or had a tough week at the office, they’ll always be there with your favorite drink (we’ll take tequila, with a dance party chaser!). You’re proud of your best friend and all of their accomplishments, so you can’t help but brag about them to everyone you know. We all make mistakes and have ups and downs, but whatever life throws at you, you can count on each other for support no matter what. Life can and will pull you in different directions, but time and distance have nothing on your special bond. No matter how far, the time apart will only make every moment together even better. From sharing inside jokes to sending each other funny memes throughout the day, no one else can make you laugh ’til you cry like your best friend.